No More Shyness: AUB Normalizing with the ’Israeli’ Enemy! Treason is not a perspective. Treason is an act of betraying one’s country by waging war against it or by consciously or purposely acting to aid its enemies. It is a crime defined in every state’s constitution and is punishable by death in many countries. Why should it be any different in Lebanon? Well, it is not but as we all know by now, Lebanon is a special country in nearly every aspect of life. Whether it is a social, political or a military scandal, we tend to have multiple views around it and bicker until a new scandal starts to trend. This time however, I chose to write about it to make sure legal action is taken against the American University of Beirut [AUB]. It is not acceptable for a university within the Lebanese borders from whomever it is funded by to break the law blatantly and without any remorse while the Lebanese judiciary system sits and watches. The screenshot you see below this Op-Ed’s title is that of an email sent to AUB students by the career center of AUB. The career center is a department within AUB and its role is to secure jobs for AUB graduate students and internships of AUB undergraduate students. 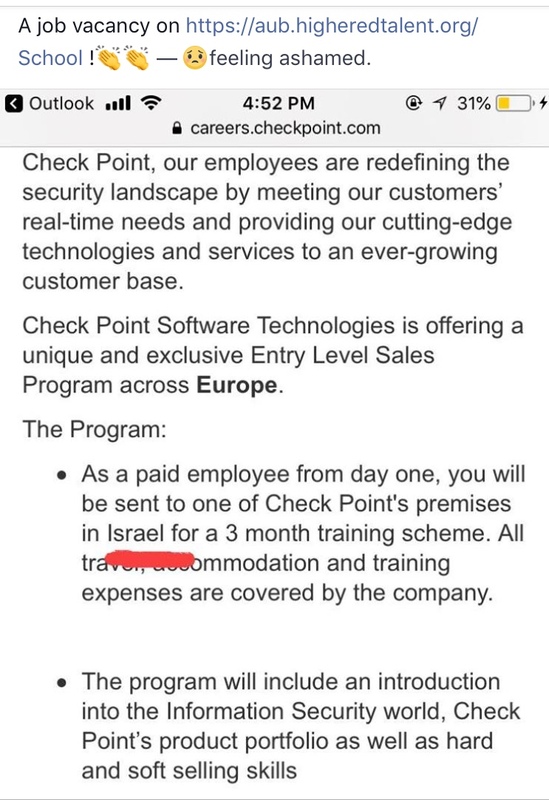 As clearly stated in the email, the job offer sent by the AUB career center is in a company called “Check Point Software Technologies.” Now, Check Point Software Technologies Ltd. is an “Israeli” multinational provider of software and combined hardware and software products for IT security, including network security, endpoint security, mobile security, data security, and security management. Its headquarters are in Tel Aviv, “Israel” [occupied Palestine] and San Carlos, California, USA as shown in the table below which can be easily found with a little research. The company was founded by “Israeli” nationals Gil Shwed, Shlomo Kramer and Marius Nacht in 1993. “Israel”. The same “Israel” that has carpet-bombed Beirut the capital of Lebanon, its suburbs, its southern districts, and the entire country’s infrastruction several times over the past 40 years. Apparently, what AUB still does not fathom is that normalization with the enemy is a crime. “Israel” while “travel, accommodation and training expenses are covered by the company.” Hence, it is not only encouraging normalization; it is tempting students to do it by securing full payment coverage as they go for it and betray their country. We already know that AUB most probably will try to dodge this crime by saying the job offer is not for Lebanese students rather for foreign ones. However, what AUB seemingly refuses to acknowledge is that its campus falls on Lebanese territories and hence is within the jurisdiction of the Lebanese law and any crime committed shall be dealt with by Lebanese authorities. By exposing such behavior, we as Lebanese trust the Lebanese authorities will take the right legal actions against those who have committed this crime. I will not hide the fact that this also makes me concerned a lot for the future of my children’s education in this country if such acts of normalization are not dealt with swiftly and firmly. AUB is indeed a very prestigious and esteemed university at the level of the quality of education and knowledge it provides, but it seems those running it need a reminder that it is operating on Lebanese soil to provide education and knowledge to “Lebanese” students first before any other foreign student. AUB already had several head turning decisions like that of terminating the job of Palestinian American professor Steven Salaita for no apparent reason other than stimulation a few Zionists back in the US and “Israel” for offering him a job to begin with. Another incident worth mentioning is when AUB banned independent political analyst Dr. Mohammad Marandi from participating in a BBC debate that was scheduled to take place on March 8, 2018 on AUB campus on the basis that he is “Iranian”. 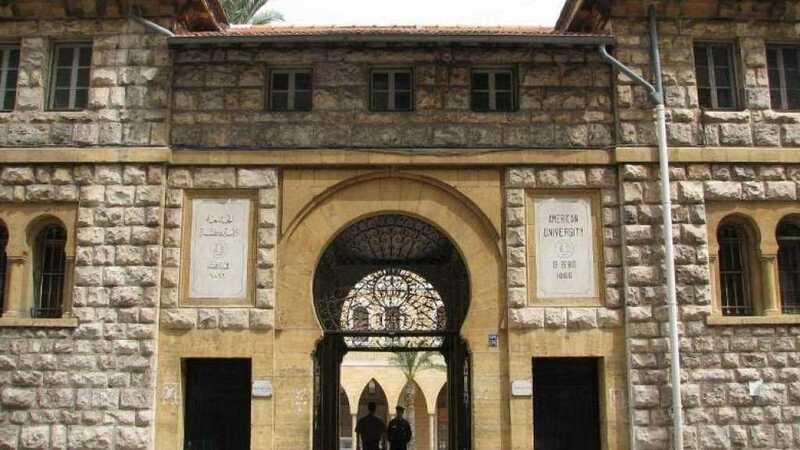 That was a decision made by the American University of Beirut, which hails itself as a sanctuary of freethinking in the Middle East and claims to provide a platform for freedom of speech. Similarly, this new decision to offer such a job that seeks to normalize ties with Lebanon’s number one enemy was also made by the American University of Beirut which supposedly encourages in the about section of its website the “freedom of thought[…] personal integrity, civic responsibility, and leadership.” Maybe AUB’s board of trustees should reinstate the university’s mission if those employed in it have set their minds to include “normalization” within the university’s vision for their current and future students. “which hails itself as a sanctuary of freethinking in the Middle East and claims to provide a platform for freedom of speech” – following obediently in the footsteps of the Zionist Deep State – free thinking, free speech, democracy, human rights… the world should understand now these were just slogans for false advertising employed by the CIA… quite clearly AUB may be in the business of providing quality education but clearly it has other more gratifying businesses to attend to as well… namely the various facets of the institutes’ slavery to the Zionists.